Immerse yourself into a world where history, nature, and activity abound! This experience is sure to be cherished for a lifetime. The cruise route showcases the best of Scotland’s lochs (aka lakes) and landscapes, including the magnificent Loch Ness. The vessel’s smartly appointed pub-style salon encourages informal socializing, while the dining room’s panoramic touring windows let in an abundance of natural light. Outside, there are separate public areas perfect for hours of leisure and relaxation, including a spacious sundeck, a shaded dining terrace, and a hot tub. Comfortable cabins provide plenty of clever storage, and a seasoned crew adds to the warm hospitality. Your onboard Chef offers a fresh and modern approach to Scottish cuisine, offering classic recipes and local ingredients, augmented by contemporary culinary methods. Decadent cheese platters featuring regional selections and a hand selected range of locally-produced whiskeys round out the uniquely epicurean adventures aboard the Spirit of Scotland. Sightseeing is compelling and comprehensive, offering memorable visits to iconic castles, royal gardens, and preserved battlefields, all of which speak to Scotland’s fascinating and sometimes tragic history. Guests with active lifestyles will thrill to the cycling and walking opportunities along the Caledonian Canal; spectacular natural scenery, gorgeous hiking trails, and miles of manicured towpath are all waiting to be explored. In the afternoon, you will be met by a crew member of the Spirit of Scotland at the designated meeting point in Inverness. From here, relax as you are chauffeured to the barge, moored in Banavie. A traditional champagne welcome and introduction to the crew awaits you, before the first of many gourmet dinners is served. Afterward, enjoy a nightcap in the hot tub! This morning’s excursion is to the mystical area of Glencoe, revered for its geographical beauty and known for one of the darkest times in Scottish history. Time permitting, we might also visit the ruins of the Old Inverlochy Castle, the original site of a Pictish fortress thought to have been sacked by the Vikings. An afternoon cruise is culminated with a stirring rendition of traditional Scottish music by an authentic Highland Piper. The canal side path beckons for a gentle pedal or leisurely stroll before Chef presents tonight's dinner. 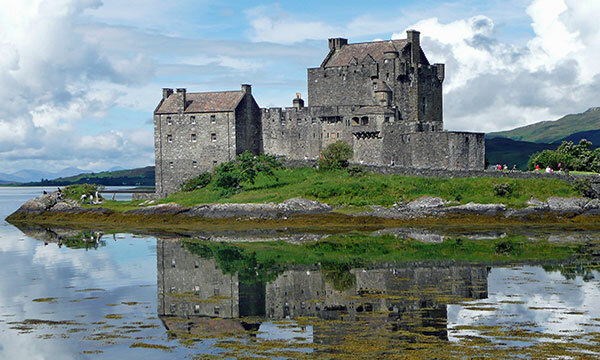 This morning, take in some of the finest scenery Scotland has to offer during the drive to one of its best known and most photographed castles, Eilean Donan, which has been featured in films such as “Highlander” and James Bond’s “The World Is Not Enough”. Your Tour Guide returns you to the barge for an afternoon cruise across the very scenic Loch Oich. Relax on deck with a wee dram and watch this extraordinarily beautiful landscape slip by. 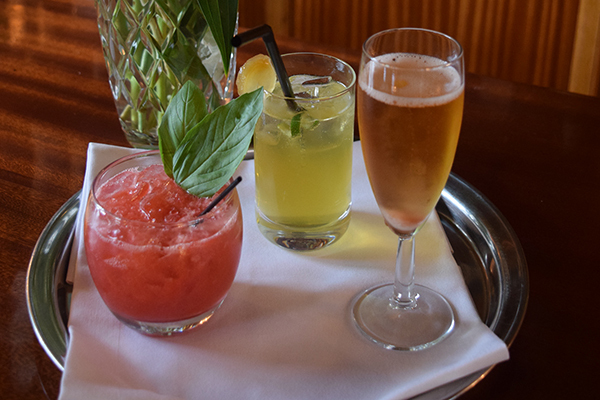 Enjoy cocktails and canapes before Chef serves tonight's dinner onboard. A morning cruise to Fort Augustus takes the barge down the flight of locks that cleverly assist the water traffic from one vertical level to another, to our gorgeous mooring at the entrance to Loch Ness. Today’s excursion is a highlight of the cruise; visit a private club on the banks of Loch Ness for a dramatic demonstration featuring birds of prey. 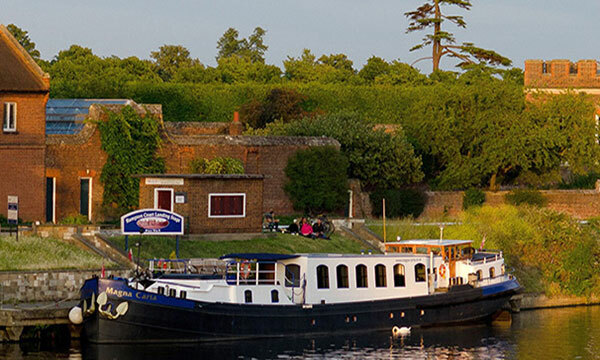 Your Tour Guide returns you to the barge so you can freshen up, as tonight's dinner is taken ashore at a locally-owned pub. Today's active adventures reveal some of the best-loved icons within Scottish culture. This morning, relax on deck as the barge gently makes her way across the world-famous Loch Ness. Once moored, your Tour Guide escorts you to the lovely Cawdor Castle, forever immortalized in Macbeth, Shakespeare’s “Scottish Play”, and where the Dowager Countess of Cawdor still resides. The day ends at Clava Cairns, a pre-historic burial site dating back to 2000 B.C.E. Back onboard, Chef is crafting tonight's dinner. 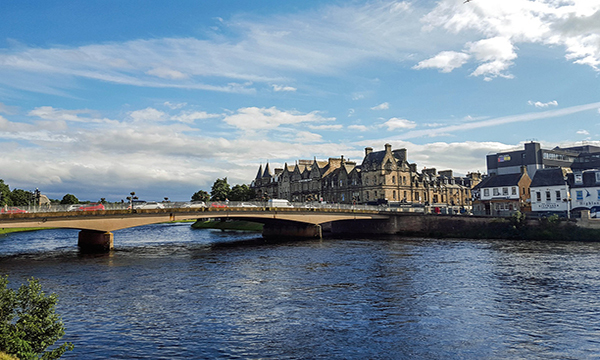 After this morning's cruise through the Tomnahurich swing bridge and the locks to Muirtown, take a gentle pedal or leisurely stroll to the sea lock with wonderful views over the Moray and Beauly Firths. This afternoon, your Tour Guide accompanies you to the Culloden Moor, scene of the last major battle on British soil. 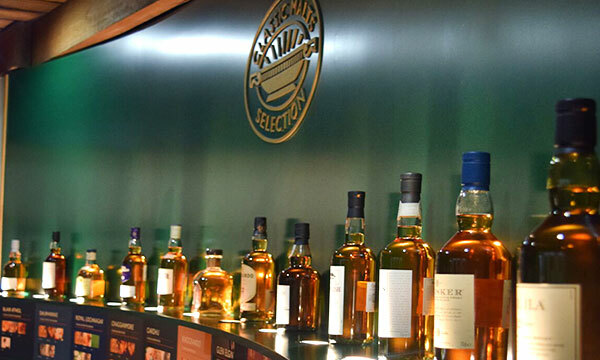 Then, tour the Glen Ord distillery, founded in 1838 on the Black Isle by the Mackenzies of Ord, and enjoy a special tasting of premium single malt whiskies. Tonight, a festive cocktail hour precedes the Captain's Dinner. After breakfast, you will be chauffeured to the designated drop off point in Inverness. 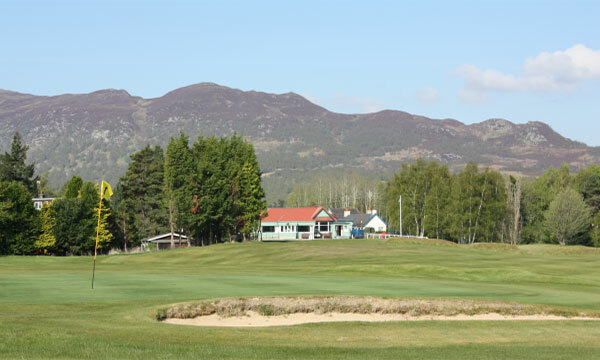 Golf today with a morning round of 18 holes at Newtonmore Golf Course, established on the banks of the River Spey in 1893. Non-golfers will experience the historical battlefield of Glencoe amidst incredible scenery. An afternoon cruise is culminated with a stirring rendition of traditional Scottish music by an authentic Highland Piper. The canal side path beckons for a gentle pedal or leisurely stroll before Chef presents tonight's dinner. This morning, take in some of the finest scenery Scotland has to offer during the drive to one of its best known and most photographed castles, Eilean Donan, which has been featured in films such as “Highlander” and James Bond’s “The World Is Not Enough”. 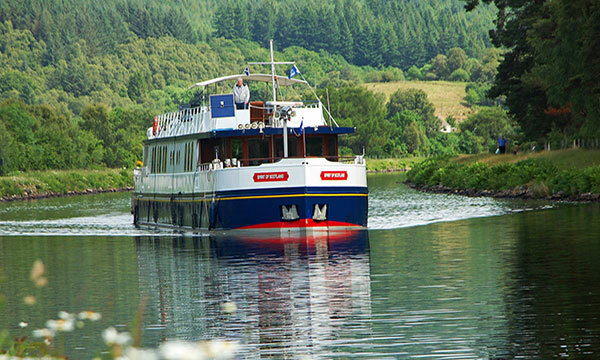 Your Tour Guide returns you to the Scottish Highlander for an afternoon cruise across the very scenic Loch Oich. Relax on deck with a wee dram and watch this extraordinarily beautiful landscape slip by. Enjoy cocktails and canapes before Chef serves tonight's multi-course dinner onboard. A morning cruise to Fort Augustus takes the barge down a flight of locks to our gorgeous mooring at the entrance to Loch Ness. Golfers enjoy 9 holes at Fort Augustus Golf Course, possibly the only course in the world manicured by a herd of sheep! 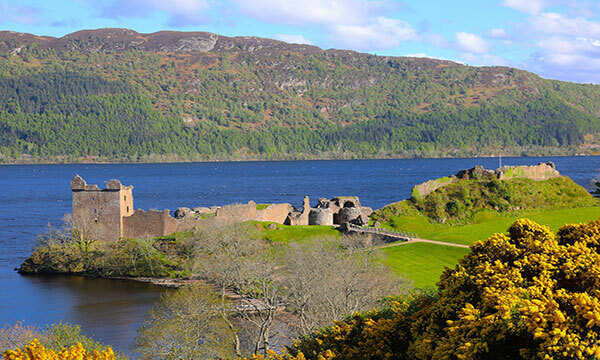 Non-golfers will visit the ruins of Urquhart Castle, then take drive to the Invermoriston Falls and the “Old Bridge”. Return to the barge for tonight's special dinner, taken ashore at a local pub. This morning, relax on deck as the barge gently floats across the world-famous Loch Ness. Golfers will then play 18 holes at Castle Stuart, overlooking the picturesque Moray Firth, while non-golfers tour Cawdor Castle, forever immortalized in Shakespeare’s “Macbeth”. A visit to Culloden Moor reveals a 17th century battlefield, followed by a pre-historic burial site dating back to 2000 B.C.E. Back onboard, Chef is crafting tonight's dinner. The golfers have an early departure for an 18 hole round and light lunch at Royal Dornoch, dating from 1616 and one of Scotland’s most acclaimed courses. The non-golfers will enjoy a scenic cruise to Muirtown, with plenty of opportunity to walk or bicycle. At mid-afternoon, both groups will meet at the Glen Ord distillery to experience the maturing process of single and blended malts, followed by a special tasting of premium whiskeys. Return to Spirit of Scotland for the festive cocktail hour and Captain’s Dinner. Please note: Golf cruises include pre-booked and paid tee times and transfers to and from the golf clubs. Hire of clubs, caddy or buggy and all other personal expenses at the courses are not included. On alternate weeks, the cruise will be in the reverse direction. This is a sample itinerary and is subject to change depending on the availability of the individual courses.